One of the most important components of an active solar energy system is the temperature controller because a faulty control is usually the cause of poor system performance. In general, control systems should be as simple as possible and should use reliable controllers, which are available nowadays. One of the critical parameters that need to be decided by the designer of the solar system is where to locate the collector, storage, over-temperature, and freezing-temperature sensors. The use of reliable, good-quality devices is required for many years of trouble-free operation. As was seen in the previous sections of this chapter, the control system should be capable of handling all possible system operating modes, including heat collection, heat rejection, power failure, freeze protection, and auxiliary heating. FiGuRE 5.28 Heat rejection by a solar heating system using a liquid-to-air heat exchanger. The basis of solar energy system control is the differential temperature controller (DTC). This is simply a fixed temperature difference (AT) thermostat with hysteresis. The differential temperature controller is a comparing controller with at least two temperature sensors that control one or more devices. 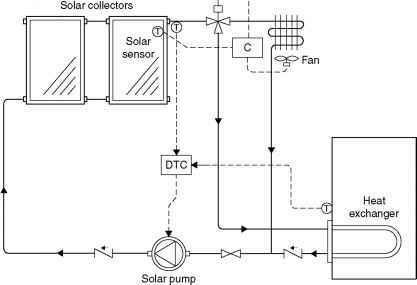 Typically, one of the sensors is located at the top side of the solar collector array and the second at the storage tank, as shown in Figure 5.29. On unpressurized systems, other differential temperature controllers may control the extraction of heat from the storage tank. 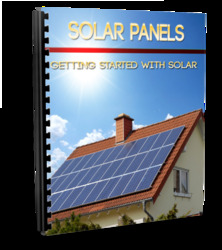 Most other controls used in solar energy systems are similar to those for building services systems. The differential temperature controller monitors the temperature difference between the collectors and the storage tank. When the temperature of the solar collectors exceeds that of the tank by a predetermined amount (usually 4-11°C), the differential temperature controller switches the circulating pump on. When the temperature of the solar collectors drops to 2-5°C above the storage temperature, the differential temperature controller stops the pump. Instead of controlling the solar pump directly, the differential temperature controller can operate indirectly through a control relay to operate one or more pumps and possibly perform other control functions, such as the actuation of control valves. FIGURE 5.29 Basic collector control with a differential temperature controller. is difficult to calculate, because of the changing variables and conditions. Typically, the turn-on set point is 5-9°C above the off set point. The optimum on set point is a balance between optimum energy collection and the avoidance of short starts and stops of the pump. The optimum turn-off temperature differential should be the minimum possible, which depends on whether there is a heat exchanger between the collectors and storage tank. Frequent starts and stops of the pump, also called short cycling, must be minimized because they can lead to premature pump failure. Short cycling depends on how quickly and how often the solar collector sensor temperature exceeds the on set point and drops below the off set point. This is influenced by the insolation intensity, the pump flow rate, the solar collector thermal mass, the response of the sensor, and the temperature of the fluid entering the collector. What happens in practice is that the water in the collector starts warming up as soon as the off condition is reached and the flow stops. As the water heats up, it eventually reaches the on set point, at which point the pump is switched on and fluid circulates through the collector. Therefore, the hot fluid in the collector is pushed into the return manifold and replaced by relatively cool water from the supply manifold, which is warmed as it moves through the collector. The most common method of avoiding short cycling is the use of wide temperature difference between the on and off set points. This, however, leads to the requirement of a lot of insolation to switch the pump on, which loses energy in the collector and may never reach the on set point in periods of low insolation. Therefore, the guidelines given in this section must be followed for deciding the correct setting. If the system does not have a heat exchanger, a range of 1-4°C is acceptable for the off set point. If the system incorporates a heat exchanger, a higher differential temperature set point is used to have an effective heat transfer, i.e., a higher-energy transfer between the two fluids. The minimum, or off, temperature differential is the point at which the cost for pumping the energy is equal to the cost of the energy being pumped, in which case the heat lost in the piping should also be considered. For systems with heat exchangers, the off set point is generally between 3 and 6°C. 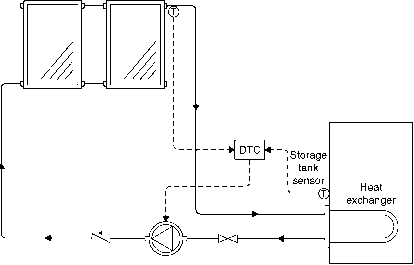 In closed loop systems, a second temperature sensor may be used in the tank above the heat exchanger to switch the pump between low and high speed and hence provide some control of the return temperature to the tank heat exchanger. Furbo and Shah (1997) evaluated the use of a pump with a controller that varies the flow proportionally to the working fluid temperature and found that its effect on system performance is minor. FiGuRE 5.30 placement of collector sensor. How to set differential temperature controller solar hot water?